This past weekend I read Anne Bogel's (aka Modern Mrs. Darcy) new ebook, Work Shift: How to Create a better blend of work, life, and family. There are many things I enjoyed about the book. It was easy to read. I finished the book in a few hours and am already finding myself wanting to go back and re-read some sections. They were THAT good. I loved Work Shift because of how well-educated Anne is on this topic. She used quotes when appropriate and personal stories to validate the statements she makes. As you might know, Anthony and I don't have any kids and we both work full time. Even without kids, this book had applications for me! I appreciated that Anne addressed nearly every scenario a person might be in (married with kids, families with breastfeeding babies, single moms/dads, couples, both parents working full time, etc) and how to blend work and family life. Have you ever heard of "share care?" I learned about this term through Work Shift. Share care is where parents share the care of raising their children. It has long been a pet peeve of mine when a mom says their husband is babysitting the kids. I don't think of a parent watching their kids as baby sitting. Sharing the care is a much better description of what is happening! I needed to put my thinking cap on as Anne discussed the cultural shift "work" has gone through over the years. She discusses farm life, the industrial revolution, factory work, and how the Dot Com boom enabled the internet. I loved the history and economics she walked me through with Work Shift. Bottom line: buy the book. I'm sure you'll learn something from it. Anne is giving away one copy of Work Shift (the ebook) to one of you! To enter the giveaway, simply leave a comment letting me know you'd like to win. The giveaway will be open until Thursday, September 20, 2012 at 8:00pm PST. 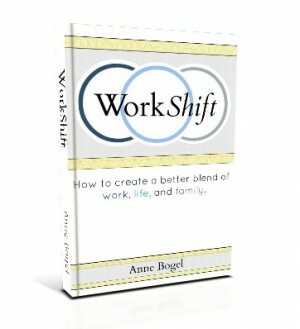 I was given a review copy of Work Shift by Anne Bogel. However, all opinions are my own. This post contains my affiliate links. The giveaway winner must be over 18 years old. The winner will be chosen randomly and notified via email. The giveaway winner is number 7, Deanna!